Take 42% off the entire book. Just enter code sscpa into the discount code box at checkout at manning.com. 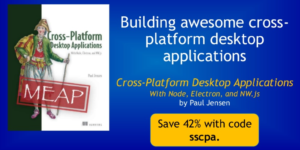 Cross-Platform Desktop Applications guides you step by step through the development of desktop applications using Electron and NW.js. This example-filled guide shows you how to create your own file explorer, and then steps through some of the APIs provided by the frameworks to work with the camera, access the clipboard, make a game with keyboard controls, and build a Twitter desktop notification tool. 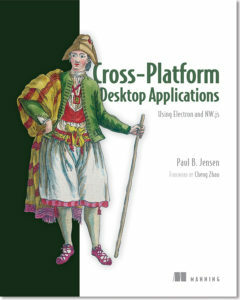 You’ll then learn how to test your applications, and debug and package them as binaries for various OSs. Learn more in the slide deck below.